Thermage® is a non-invasive treatment that is used to tighten skin on the face, neck, forehead, eyes, and other areas of the body. Thermage® has the unique advantage of having zero downtime – after treatment, there is no bruising, swelling, or skin redness. It’s a great solution for those who seek tighter and younger skin, but can’t take any time away work or social life. Thermage® is truly a no downtime procedure which has a very high safety profile. Our office has the latest, most powerful version of the Thermage®: the Thermage® CPT™ System, which can tighten skin more effectively and with less discomfort than older Thermage® treatments or ultrasound-based therapies (like Ulthera®). For more information on Thermage®, please contact us today. We are one of the leading Thermage® providers in the Los Angeles area. We have enjoyed high success rates and patient satisfaction with our unique approach to Thermage® treatments due to the following: Dr. John Vartanian only selects and recommends Thermage® to patients who are good candidates for this procedure. Not all patients will benefit from Thermage®, thus Dr. Vartanian will only recommend Thermage® if he thinks it will likely work for you. Thermage® results can vary from person to person, since each person’s existing skin aging and response to treatment may be different. To get the best results for our patients, Dr. Vartanian uses innovative techniques like tissue vectoring patterns, multiple overlapping treatment spots, and customized treatment patterns to maximize Thermage® results. We utilize larger treatment areas with more pulses per area in order to get the best results possible for our patients. Our staff is very experienced with Thermage® procedures and they have been trained and certified by the makers of Thermage®. As an innovator in the field, Dr. Vartanian has developed a number of treatment protocols designed to increase both the effectiveness and comfort of Thermage® treatments. Aging is an active, ongoing process that affects all of us, and can negatively affect the way we look and feel. Thermage® CPT™ is a proven treatment that can help improve the appearance of sagging or loose skin, giving you a tighter and younger look. Thermage® typically works in just one treatment with no downtime and delivers a natural looking result. The results last for several years, but may differ from individual to individual. Since aging is occurring constantly, some patients decide to “get ahead” of the aging problem, by having a Thermage® procedure performed yearly in order to stop some aspects of facial skin aging. Multiple Thermage® procedures can help bring about more dramatic tightening results. In such cases, we generally advise a 6-month interval between treatments. 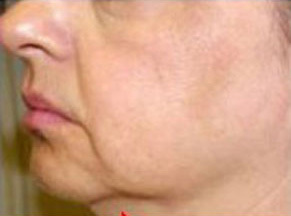 We can also combine Thermage® with other procedures like neck liposuction and laser treatments. The Face & Neck – With age, the face and neck skin can sag, resulting in loose jowls, extra skin in the lower face & neck, and other undesirable signs of facial aging. Thermage® tightens the facial and neck skin by remodeling collagen and stimulating new collagen formation, resulting in skin tightening. The results often look very natural since facial features are preserved and improved. With age, the brows can also drop, resulting in lower brows that can look angry, with crowding and extra skin on the upper eyelid. Thermage® can be used to elevate the brows and rejuvenate the forehead. The Eyes – Thermage® can be used to treat the upper eye areas by shrinking the extra skin, resulting in a non-surgical improvement of the eyelids that preserves the natural look of the eyelid. Age, extra skin, hooding, and a lowered brow line can make us look worn-down, angry, or tired. In some patients, upper eyelid Thermage® is often combined with forehead Thermage® in order to raise the brows and shrink upper eyelid skin at the same time. Abdomen – Weight loss, pregnancy, and aging can create loose skin around the abdominal areas. Thermage® can be used to tighten mild to moderate degrees of abdominal skin looseness without the scars or downtime of abdominal surgery. Arms and Legs – Loose skin around the hands, arms, elbows, knees, thighs, and buttocks can be unattractive, and Thermage® can improve these issues without the scars or downtime of surgery. Thermage® can also improve the appearance of cellulite. Other Body Areas – Thermage® for the body has the advantage of avoiding the scarring typical in surgical body tightening and lifting procedures. Thermage® is a non-invasive way to tighten skin on a variety of body areas. Thermage® CPT™ is a non-surgical and non-invasive skin rejuvenation procedure. Thermage® treatments are all about energy – focusing radiofrequency energy to jumpstart the skin’s own built-in natural renewal process. Like most smart technologies, the process is relatively simple – it’s a combination of deep heat energy to treat deep tissues, combined with superficial skin cooling, to protect the skin surface and deliver better patient comfort. Our latest version of Thermage® includes patented Comfort Pulse Technology (CPT)– where gentle vibrations and coordinated skin cooling make Thermage® treatments even more comfortable. Thermage® is designed to deliver results in one treatment session. The entire Thermage® procedure will typically take about an hour to complete for the face, and longer depending on the areas treated. During the procedure, the Thermage® handpiece is placed on the targeted area of skin. Radiofrequency energy will penetrate deep into the skin in order to heat, tighten, and stimulate collagen production. Once complete, patients can wash their face, apply make up (if desired), and return to their normal daily activities. Treatment begins with a cooling effect on the skin for comfort and safety of surface layers. Radiofrequency energy penetrates deep into the skin’s tissue, heating the treatment areas and remodeling the collagen. Final delivery of cryogen to cool the epidermis. Thermage® is a zero downtime procedure. Someone receiving a Thermage® treatment in the afternoon can easily plan on attending a social function that evening with no bruising or other tell-tale signs that a procedure was performed earlier that day. Very mild and faint redness from the skin cleansing may be experienced in rare cases in the immediate hour or so after treatment. In such cases, makeup can be used. Length of procedure? The average procedure generally lasts about an hour, but treatment times will vary depending on the extent of skin areas treated. What about Recovery? As a zero downtime procedure, patients are often able to return to their daily routines immediately following Thermage® with no bruising or other issues. What about results? Thermage® can produce tighter, firmer skin in various areas of the face, neck, jowls, eyes, and other body areas. 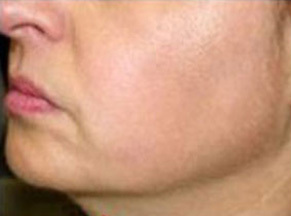 Immediately after Thermage®, the patient typically feels tighter skin in treated area. In the next several months after Thermage® treatment, as new collagen is made by the body, the skin tightening process continues. Thermage® is designed to work in one session and the results can last for several years. Thermage® results can vary from person to person, since each person’s degree of skin aging, ability to form new collagen, and response to treatment can be different. For more information on facial skin rejuvenation with the Thermage® CPT™ System, or to schedule a one-on-one consultation with Dr. Vartanian, please contact our office today. Our friendly staff will be happy to answer your questions and assist you in any way we can.